George Whitfield, the great Oxford-educated preacher, whose rhetorical prowess is reported to have driven 15 people mad during his first sermon, warned against the improper celebration of Christmas, in his sermon, “The Observation of the Birth of Christ.” Given our modern American obsessions with all things electronic, with the acquisition of endless piles of stuff, and with Christmas becoming yet another excuse (as if we really needed one) for gargantuan self-indulgence, I can’t help but find Whitefield’s words challenging and relevant. No need to go mad, though. Just do something for those less fortunate this Christmas. It really is the best way to celebrate the occasion! 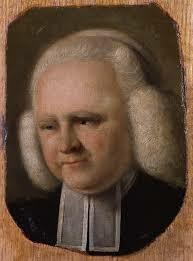 George Whitefield, Selected Works of George Whitefield, Accordance electronic ed. (Altamonte Springs: OakTree Software, 1997), n.p. Let your alms sweat in your hands, until you know to whom you should give. If he asks for money, he is a false prophet….But whoever says in the Spirit, Give me money, or something else, you shall not listen to him. But if he tells you to give for other’s sake who are in need, let no one judge him. But every true prophet who wants to live among you is worthy of his support. So also a true teacher is himself worthy, as the workman, of his support. Every first-fruit, therefore, of the products of wine-press and threshing-floor, of oxen and of sheep, you shall take and give to the prophets, for they are your high priests. But if you have no prophet, give it to the poor.